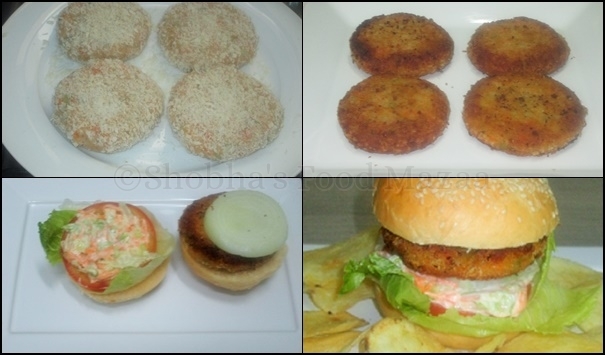 Burgers have always been a favourite choice of everyone among the fast food, specially kids. One can easily make them at home without much effort with basic veggies always available in every kitchen. If you are fond of baking you should bake the buns at home too as they are much healthier without any preservatives added to them for increasing the shelf life. So make and enjoy your home made burgers with your choice of accompaniments and sauces and chips or French fries. Fresh bread crumbs .. 1/4 cup + a little for coating. 1. Boil the vegetables and mash them. 2. Add salt, cumin powder, chilli powder, mint leaves, salt and bread crumbs. Mix well. 3. Make cutlets and coat them with bread crumbs. Fry them and set aside. 4. Make a salad with grated carrots, chopped lettuce leaves and mayonnaise. 5. Slice the burger buns and place the lettuce leaf on each base. 6. Keep a tomato slice and spoon some salad over it. 7. Place a fried burger and a slice of onion. Spoon some sauce of your choice. 8. Place the bun slice and garnish using a sate stick and cherry tomato. Very nice! 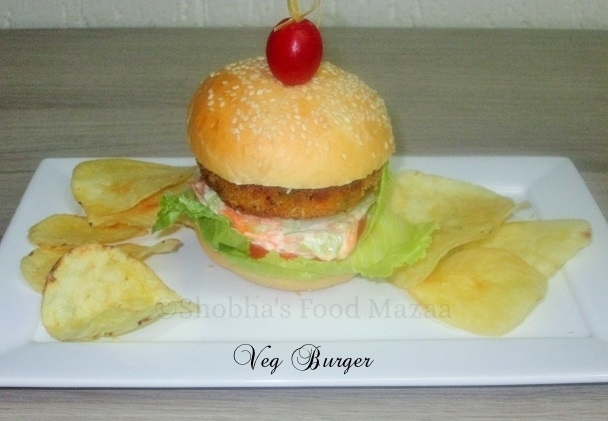 Looks very tempting..
me n my kids loves burgers..planning to make this week..veg version sounds gud..u made perfect..